Maybe you’ve been to Berlin. Checked in at Checkpoint Charlie, snapped a selfie at the Wall, perhaps even visited one of its infamous “anything goes… and everything does” nightclubs, where you’d be wise not to advertise your dubious exploits on Instagram. But there’s far more to Germany’s capital than you can tackle in one long, louche weekend. With the Berlin Biennale contemporary art exhibition returning in June and VisitBerlin’s new 365/24 website cataloging 366 tips for tourists this leap year, the city offers fresh discoveries every day. Here are ten of the best. You haven’t really experienced a destination until you’ve seen it through a local’s eyes. Seeking someone to reveal Berlin’s hidden passageways and provide an insider’s perspective on its warts-and-all history, I turn to Touriocity, a UK-based company that allows you to personalise tours in dozens of cities and matches you with a guide based on your interests. While East Berlin has become increasingly gentrified over the past 25 years, largely edging out the squatters, artists and club kids who once flocked here in droves, Klages unearths elements of gritty authenticity on both sides of the erstwhile wall. Even in Mitte, which has risen from relative neglect behind the Iron Curtain to become Berlin’s most polished, tourist-packed neighbourhood, Klages leads me and my husband to vibrant quarters we would never have discovered on our own. As we enter Hackesche Hofe, it feels like falling down a rabbit hole and landing in a courtyard lined with psychedelic murals, embraced by an old factory housing fashion designers, galleries, an art house cinema, and a hole-in-the-wall bar. Nearby, we duck into Clarchens Ballhaus, a retro dance hall dating to 1913, and pause before a boxy World War II bunker that’s now home to the Boros private art collection. “I remember it as a techno club in the 90s,” Klages recalls with a rueful smile, surveying the hulking expanse of concrete. In West Berlin, we take in the multi-ethnic markets, kabob shops and cafes of Kreuzberg, where women in sober black hijabs and elderly Turkish men with bushy white mustaches live alongside dreadlocked hippies and bearded men with buns. “It’s the centre of alternative Berlin,” Klages says, noting that the district tried – unsuccessfully – to legalise marijuana sales last year. Berlin is renowned for three things: the Wall, the Brandenburg Gate, and spies. Three new multi-media museums highlight each, bringing the city’s tumultuous past into focus in a way that university textbooks never could. 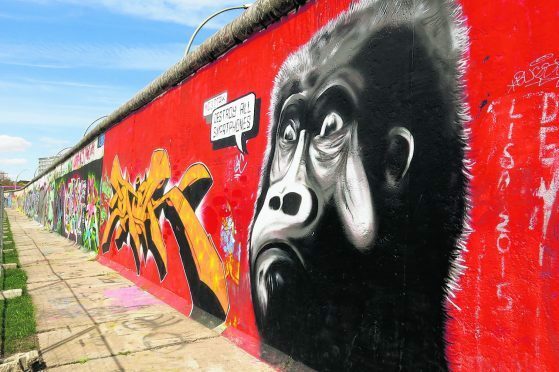 The Wall Museum, located alongside the River Spree and the East Side Gallery – a surviving section of the wall emblazoned with murals championing freedom and change – debuted in April atop the incongruously kitschy Pirates Berlin restaurant. Thirteen themed rooms trace the evolution of the wall through newsreel footage spanning 1945 to 1989, as well as remarkable interviews with those who tried to flee to the west and the soldiers ordered to stop them. At The Gate, which opened opposite the iconic Brandenburg Gate in April, 300 years of world events centred in Pariser Platz unfold in a 20-minute long barrage of images splashed across four walls. It’s a bit like hovering above the square in Dr. Who’s TARDIS as Napoleon invades, World Wars take their toll, and the Berlin Wall rises and falls. Step through an airport-style security scanner and into the high-tech sphere of super sleuths at the Spy Museum Berlin, unveiled last September. One section highlights movie props and costumes from Bond films, but the most fascinating elements are original and replica gadgets from the real world of espionage, including a lipstick pistol, a camera embedded in a lacy red bra, a poison-dart umbrella, and a glass eye with a secret compartment. “Wow, you really have to be committed to your work to gouge your own eye out,” my husband deadpans. At Crackers, the latest venture from Berlin’s legendary nightlife entrepreneur, Heinz “Cookie” Gindullis – we follow two stylish silver foxes and a blonde in black leather through a metal gate, past velvet curtains, down a concrete corridor, and through the kitchen. Having run – or rather, strutted – the gauntlet, we finally emerge into a candlelit cavern pulsating with DJ-spun tunes, where Berlin’s coolest hipsters pose on plush teal banquettes. Sculpted beauties coo over martinis, middle-aged men rock shoulder-length manes, and a waiter with a perfectly coiffed quiff appears so shocked when I order tap water that I wonder if “tap” could be German for “toilet.” I’m happy to report that the water tastes just fine, as did our steak and fish, but the real feast here is for the eyes. When it comes to bars, you can pick your poison in this thirst-quenching capital. In Friedrichshain, the Fairytale Bar offers a through-the-looking glass (or perhaps down the cocktail glass) experience, with costumed staff and ethereal libations that reference the likes of Alice in Wonderland and Snow White. If you spot a dancing pink elephant – usually a harbinger of one hellacious hangover – it’s hard to know if it’s the booze or just another illusion. The circus has come to town – Prenzlauer Berg, to be precise – in the form of Zum Starken August. There’s no big top and no clowns, thank heavens – although the bar does host occasional Vaudeville-style events – but a couple of antique carousel horses and a bench fitted with wagon wheels lend the place a vaguely old-fashioned, gypsy caravan kind of feel. The overwhelming impression is of homespun, unpretentious comfort, with peeling plaster, mismatched sofas and chairs, and a tea table made from a re-purposed espresso machine. It’s the sort of place where you pop in for “one quick pint” and inevitably stay for an all-night session. On a warm summer evening, you can’t beat a tipple on the Rooftop Terrace of Rocco Forte’s Hotel de Rome in Mitte. Kick back on the sofa cushions and drink in views of the State Opera House, the television tower and the cathedral-studded skyline. Where to stay: The 400-room Westin Grand Berlin occupies an enviable location in Mitte, bordered by Unter den Linden and the popular shopping street of Friedrichstrasse. The hotel encompasses a garden, a 30-metre-high atrium topped by stained glass, and a grand staircase that featured in an adrenaline-fueled chase in Matt Damon’s The Bourne Supremacy. For a unique experience, book the “Fall of the Berlin Wall” package, which offers the opportunity to chip away a souvenir from a section of the Berlin Wall in front of the hotel. Additionally, the package includes two nights accommodation, breakfast, a Berlin curried sausage and a glass of Champagne. Package from 382 Euro (£297) for a double room. Regular double room rates from 129 Euro (£100). Visitor info: http://www.365-24.berlin/?lang=en and http://www.visitberlin.de/en. Berlin WelcomeCard, including travel pass with free transport, discount deals, city map and guide from 19.50 Euro (£15). For more about Berlin’s districts, with 700 tips from city residents, download VisitBerlin’s “Going Local Berlin” app at http://www.visitberlin.de/en/article/going-local-berlin.